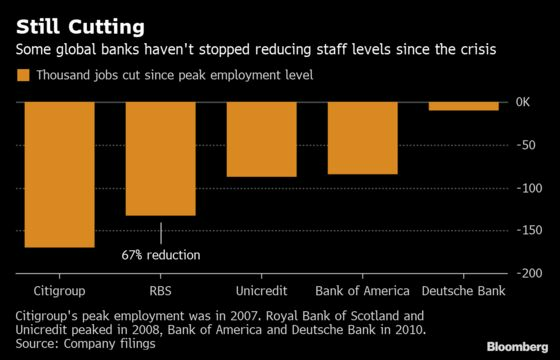 (Bloomberg) -- Hundreds of thousands of jobs have disappeared on Wall Street since the 2008 financial crisis and some of the biggest banks haven’t stopped cutting. Still, some firms managed to reverse the trend and are slowly boosting staff levels. While 802,000 positions were eliminated by the 16 largest firms in the U.S. and Europe following the meltdown, 76,000 new ones have been created at nine of those companies, according to data compiled by Bloomberg. 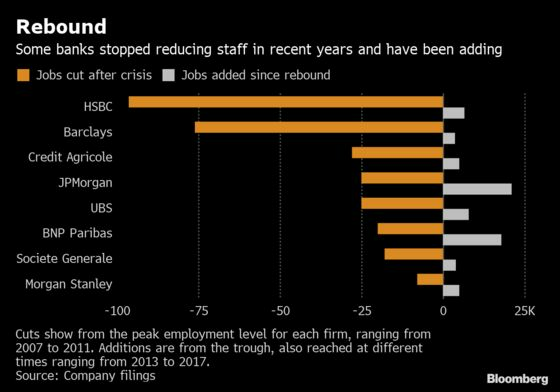 JPMorgan Chase & Co. and BNP Paribas SA have almost reversed all their post-crisis job cuts. Citigroup Inc. and Royal Bank of Scotland Group Plc, which have carried out some of the biggest cuts after the crisis, continued to eliminate positions in 2018. Deutsche Bank AG, which started cutting much later than most peers, has announced major reductions yet to come. Some of the jobs went to smaller firms when the big banks sold off units after the crisis. Automation and new technology have been replacing workers while reduced risk-taking trimmed demand for professionals in areas such as structured finance. Front-office headcount for investment banking and trading fell for a fifth year in 2018, according to Coalition Development Ltd. data. Meanwhile, compliance jobs are more plentiful post-crisis because of new regulations and tougher monitoring of financial controls. 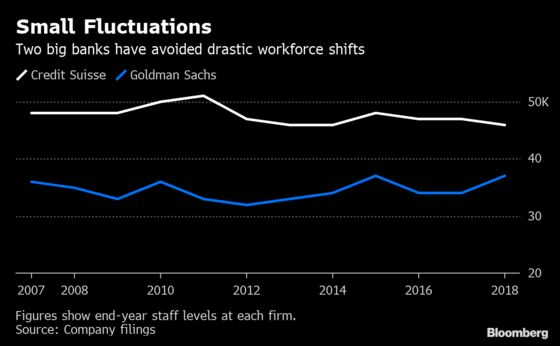 Those competing forces have kept staff levels pretty consistent at Goldman Sachs Group Inc. and Credit Suisse Group AG. Wells Fargo & Co. has done the least trimming despite facing regulatory censure in the past two years, reducing its workforce by less than 5 percent from a 2010 peak.